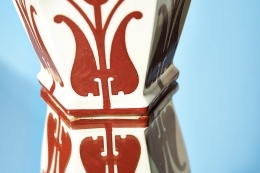 This charming, undulating pillar vase is part of Arabia's "Fennia" range, which was produced from 1902 until the 1920s. 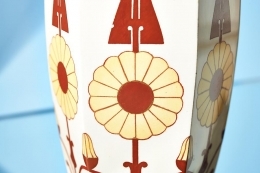 The décor consists of highly stylized sunflowers, leaves and roots that lay on the faceted the body. Bright colors against the white surface is an especially appropriate scheme for Finland, where traditional garments included vividly colored woven textiles often seen against a background of snow. 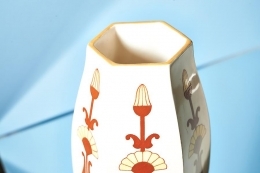 This vase illustrates the joy and beauty of springtime after a long cold winter.